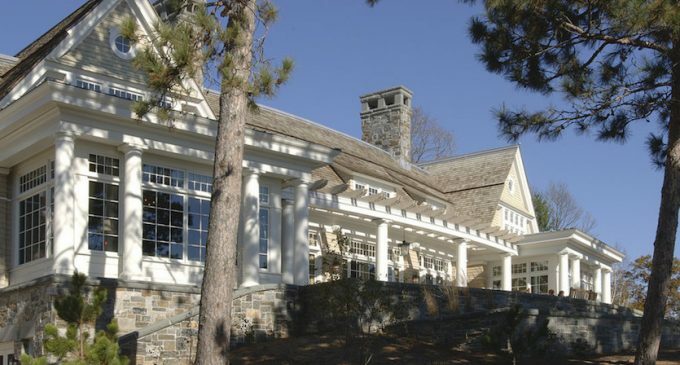 Minneapolis-based architectural firm TEA2 Architects designed this charming lake house with shingle-style characteristics and classically-inspired interiors in Northern Minnesota. The residence sits elevated on a sloping lot with spaces designed to take full advantage of the lake view. The interiors are elegant and more classically-inspired with columns, extensive moulding, beamed ceilings and ornate lighting. Enter into a charming circular foyer providing access to all the home’s central principal rooms, including a large formal living room with commanding lake views, a lovely panelled study and dining room with walls of glass. One of the home’s most intriguing features is the elongated sunroom with towering fireplace and direct views of the lake. Scroll down and take a tour inside this wonderful lake home by TEA2 Architects.